Since the launch of Haloscope, my eyes just can't look away from all Glossier's product. I knew 'em before, but I thought it's too expensive for such lightweight and sheer finishes formula. I started out with the Haloscope, Stretch Concealer, Boy Brow, and Generation G, I thought if I want to spend my money on it, better buy something I would wear a lot. It was all like love at first sight. I love the packaging, the color theme, the font, (other thing I love love love from Glossier, talk about it more below), the formula, the finish (eventhough it really is sheer), practically everything I can see and do to it. I continue to play around the products and fell in love even more, so I just kinda closing my eyes to the hefty pricetag and adding more and more to my collection. 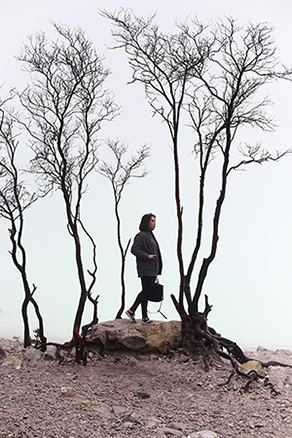 Like any other brands nowadays, you love the brand for the image they're representing. 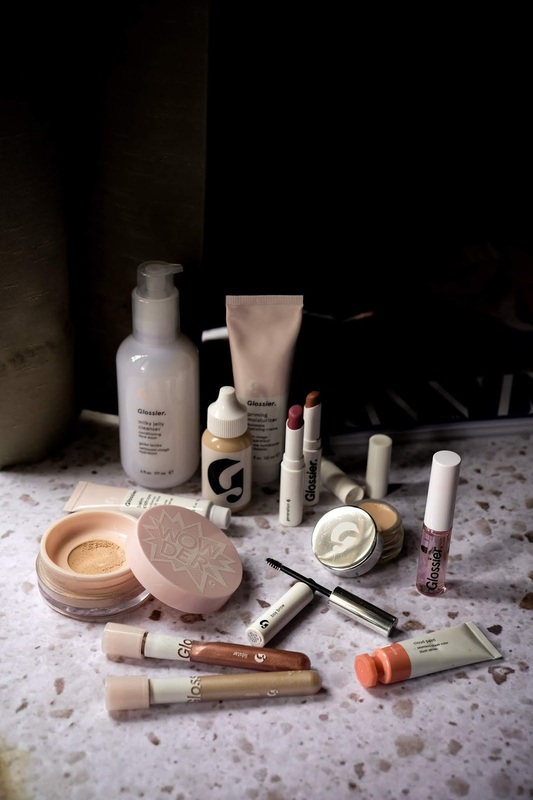 For Glossier, they set the bar for millenials, with their Glossier pink, simple yet bold font, and approachable makeup look that make them feels like within our reach. 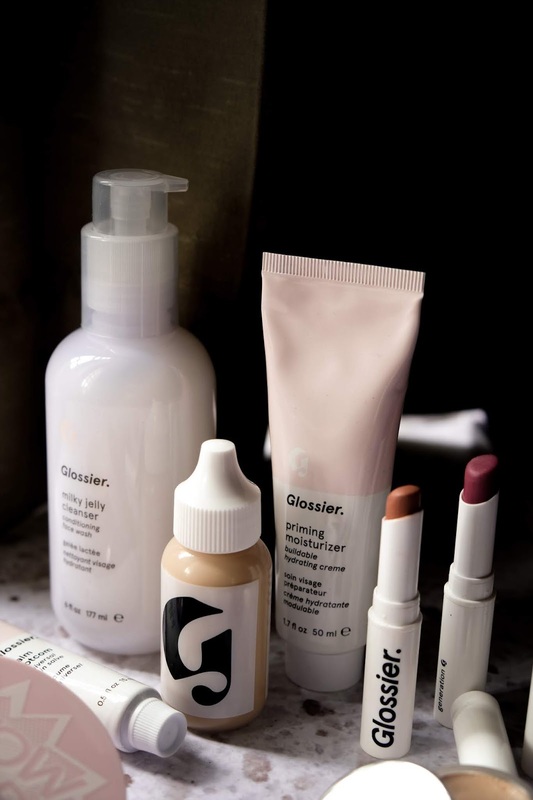 Glossier feels current, up to date, stylish, cool, chic, and almost everything you want to be, yet do-able. It has this charm to attract us to come closer, everyone's invited. This feeling of inclusivity is something I think has never been done before by a makeup brand. I haven't check on their official statement but from a far, looking at their products and branding, makes me come to a conclusion that they want to have everything super easy, super fast, foolproof, blink-of-an-eye kinda vibe. They bring effortless to the word itself. Their products are all very well thought out, even if it's your first time using it, you've mastered it. There's simply no way you can ruin your look. The formula is a dream come true. 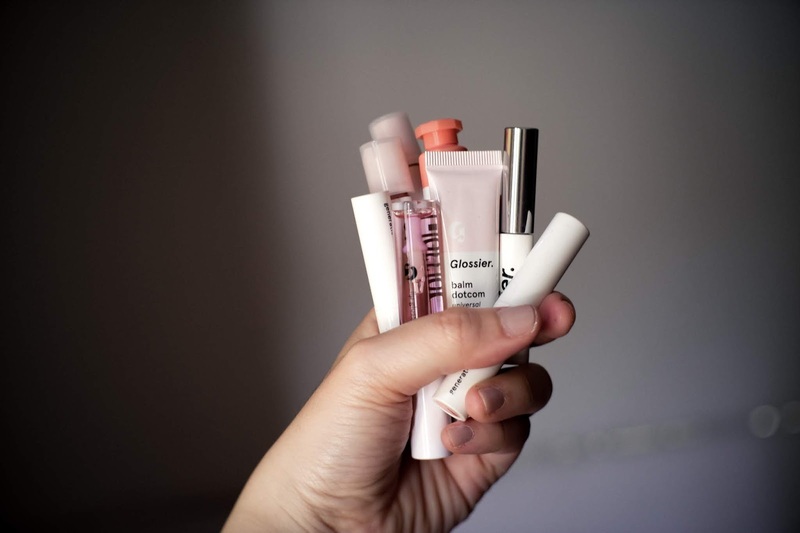 As a person who loves to look super natural using makeup (I know, girls nowadays), Glossier has created the perfect sheerness that finishes in something very believeable as yours naturally. Boy Brow gives you thick luscious eyebrows you've always dreamed of, Skin Tint gives you healthy glow that you wish your skin actually is, Stretch Concealer gives you the evenness you hope your skin could be. Even when they don't seem like believeable as natural, they look absorbed to your skin, as if you are meant to look that way. The color, the spreading, the blendability, the pigmentation, all are formulated perfectly to look just like how we hope our face to look like. Ourselves, but better. Longevity is never something they brag or pointed out, they wear out through out the day but since they're very blended to my skin, I can't even tell. What sold me and made me really appreciate their sheerness is the Generation G lipstick in shade cake. I have never in my life found a lipstick that I fell in love from all angle. There's always some justification I made, mostly because the colour is pretty, but Generation G just hit the right spot in my preferences, light weight sheer color, comfortable on the lips, doesn't look like I'm wearing any, plus I look cool when I do touch ups (thanks for the branding, Glossy!). Most of their formulas are sheer but buildable. I can still see my skin, I can see my self right through it. The sheerness embrace my natural condition. They add colour but not adding any texture. It doesn't stop on the formula and the actual packaging, but their boxes are also very well designed. Coming from an ex-product developer here. Even for the flap of your box can have so many shape and functionality options. So this kind of detail really makes me love them even more. So when you receive or buy Glossier products, they come in invidual boxes, right? Pay close attention to the top and bottom closing flap. On the top flap, they have blunt, uncut edges, this means you can open and close the box multiple times without ruining it. Eventhough from functionality it doesn't stay in place as well as if you put a cut on there. On the bottom flap, they got a slight cut on the edges, now this cuts are made to hold the flap more in place, almost like a semi permanent keys for the box. This makes the flap harder to open and if you tweak it from the side, most likely it will tear. Since it's the down side, this cut is good because you actually want something to hold the product in so it doesn't slide out the box when you pick it up. [TL;DR] Top flap - No cut, easier to open, can be opened and closed multiple times. Bottom flap - Cut on edges, harder to open, hold the product in. (No pict cause I'm too lazy). With all this and their explicit vision about their brand, you don't go buy them so you can make an instagram makeup, it won't do anything even near to it. You buy Glossier to be yourself, to feel good about being you. It's your skin, your face shape, your texture, it's your strength and weakness, Glossier is promoting image about being yourself no matter what. The biggest turn off for me is the price tag, but really, after experiencing the products my self, I couldn't recommend it enough to everyone whose down for a natural looking makeup. At this moment, I prefer products I really use and will definitely finish and repurchase, rather than buying cheaper stuffs that'll go to waste. I guess it's save now to say that I'm hooked with Glossier.